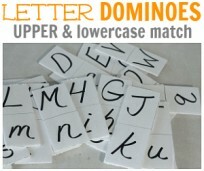 Letter Of The Week N ! My son is way into numbers right now, it was letters for so long I was starting to think he would never be into anything else! Wrong. Now he points out numbers at the grocery store, numbers in books, everywhere we go. I am not sure when I will stop hearing “More numbers, more numbers mama!” so I am running with it and here is out letter for the week! Gather your materials. 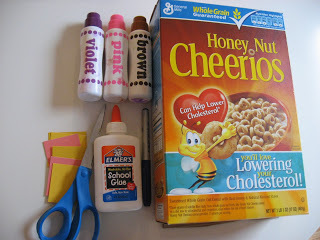 You will need some heavy paper or cardboard, small pieces of paper, one piece of construction paper, marker, glue, paint and scissors. 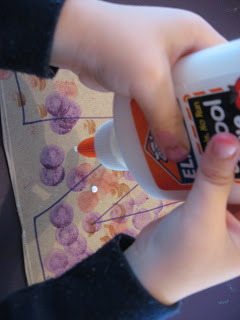 I am using the do a dot paint because the paint goes on really light and you can glue on it without waiting. Always good with toddlers! 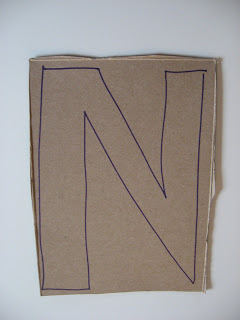 Start by making a large uppercase N on the cardboard. Don’t worry if it’s perfect, as long as your child can tell it’s an N, it’s doing it’s job. 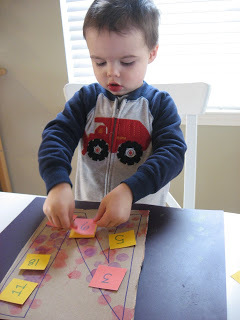 Invite your child to art time and have them paint the N, I try to have everything laid out so it’s enticing and organized when my son comes to see what we are doing, on those days everything really does go much more smoothly. 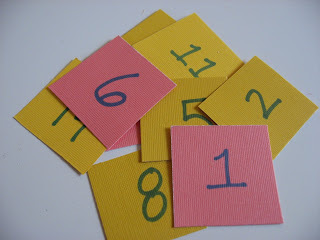 While they paint write numbers on the small pieces of paper, I am using some scrap card stock, which will hold up to being glued better than thinner paper.If your child is able to , have them write the numbers themselves. 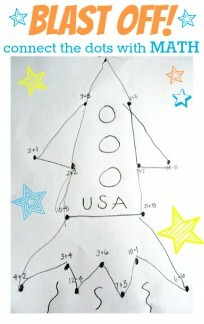 Add whatever numbers your child is interested in. Grab the glue. 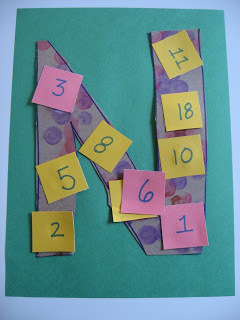 Add your numbers and label them as your child adds them. Let dry. When dry cut the N out and glue onto the construction paper. ” 1, 2, 3 To The ZOO” by Eric Carle is fun counting book perfect for toddlers. 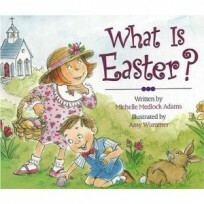 Actually as I type this my toddler is reading it. There are no words, just pictures and numbers and that makes it perfect for toddlers who are just learning both numbers and animals because parents can read it slowly counting , naming the animals and making the animal sounds, or more quickly just counting! ” Daddy Hugs” by Karen Katz is a cute little counting book for toddlers. I gave it to my husband last year for his first father’s day and my son hated it. However in the year since it’s become a favorite and nothing beats a board book for when toddlers get to that destructo stage. 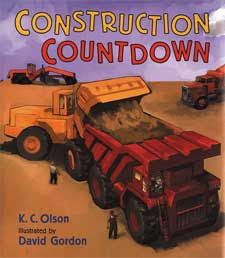 ” Construction Countdown” by K.C Olson is a counting book that uses backhoes, dump trucks and cement mixers among other things to count. Before I even closed the book my son was signing for more. I read it 4 times since getting it out of the library today. A huge hit here! Previous Post: Weekend Re post :Parent and Tot Project ! Love this craft! Very cool! My son LOVES that construction alphabet book! we ck’d out the Construction Countdown book for my “truck lover” 21 mo old. i was going to recommend it to you but glad to see you’ve discovered it too. We LOVE IT! 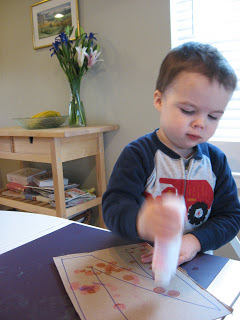 With an 18 month old I would start with exploring textures, finger painting , using big brushes and lots of opened ended art activities. Expect activities to be very very short ( 5 minutes is amazing) and just let them play.